In this guide to “the dark side”, On Stage Lighting looks at light’s oppo – shadow. 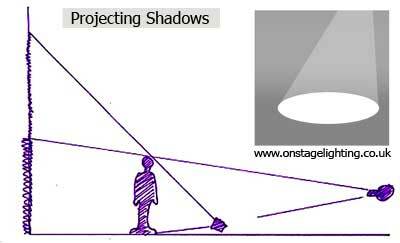 Understanding shadow, the lighting designer can control it, avoiding unwanted shadows while creating others for effect. It’s simple. Light travels in straight lines until it hits something, then it does something else simple. Like bounce off in another straight line. I like this kind of predictability in an otherwise hap-hazard life. Shadow, being an absence of light created by an object (we’ll call it “the subject”) blocking those straight lines, are equally predictable. We can plan shadows using simple technical drawings and control them just as easily as light. Each light source creates one shadow per object. A myth about lighting and shadows is that you can make them go away using more light sources – this isn’t true. More light sources = more shadows. As light travels in straight lines, the area that a shadow will be cast can easily be calculated using a straight line from light source, via the subject, to the next surface behind. Using a lighting plan and elevation/section, we can work out how shadows will behave just as easily as our light sources. The image shows a section, with 2 light sources and some surfaces that our shadows will fall on (hope you enjoy the Biro sketches – there’s a time and place to break out the CAD and this isn’t it). Again, it’s just a matter of straight lines from light source, through subject creating an absence of light on the background surface. If you have read Focus Stage Lighting… you will have some understanding of how a lighting designer can use shadows to judge the effect of a light at stage level. Seeing your own shadow standing “within” the pool of light tells you where you are lit and not, when you move out of the light and whether two pools of light are “joined” together successfully. As lighting the human form is a pretty big part of the job, reading a human shadow is ideal. Where the light is coming from? You might have several light sources – how do you know which one is causing that spill over there? Follow a straight line from the shadow, though the subject and back to the source of the spill. At what horizontal angle is this source hitting the stage? A short shadow indicates a light source high over head, a long one shows up a much shallower angle. If your shadow is roughly the same length along the floor as your own height, we’re at around 45 degrees. You get the idea. With a number of different coloured light sources mixing on stage, you can also read or predict the “colour” of shadows. 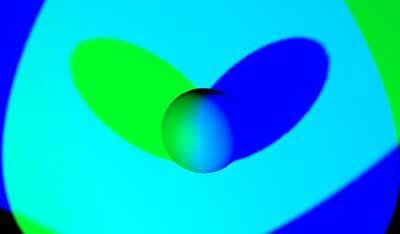 Blue and green light sources from either side will create a Cyan mix on a floor. Stick something in the way and you will also get one blue and one green shadow (shown in simplified form below). Cool colours, huh. This kind of shadow interaction that can make a colourful scene even more vibrant. 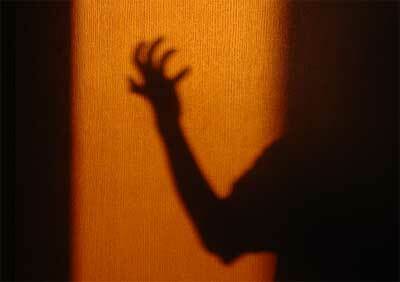 Often, Directors don’t like the thought of shadows – “ I want good lighting and definitely don’t want any shadows!”. What they mean is “I want my show lit well, so that no one is saying their lines in the dark.”. That’s understandable but we can’t have light without shadow. There are times when you want to use shadow for a specific lighting effect. When planning our effect, we can use drawings and the “straight line theory” to work out where our shadows will fall and how big they are. Some shadows are just not wanted. Shadows on a musicians score make it difficult to read the dots, shadows on a painted backcloth that depicts a landscape can ruin the illusion of perspective. Understanding the angle of a rig and using those straight lines, we can forsee any “shadows of doom” and work out how to avoid them. In the case of a backcloth, the answer is usually to light the cloth well enough from close up and overhead, washing out any stray shadows from frontlight further down stage. Putting some distance between the rear of the performance area and a cyc, while front lighting from a steeper angle, also prevents a shadow on your “sky”. To rear project a shadow play onto a surface, you might want a wide “acting area” of light from a single source (only one shadow per subject). We know that if you put the source low down / closer, it will make the subjects loom large on a big surface – it’s predictable using our section drawing. Higher up and further away, the shadow players get shorter. We also know that if we want a hard edged shadow, we need a small point source of light. Shadow puppetteers use this to alter the size of their projected images, actors can do the same. The image shows a backlit shadow scene projected onto a cyc with the light source in different positions and the resulting shadow heights. Moving the actor in relation to the the source can have a similar effect. 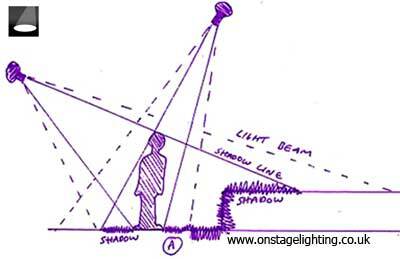 The traditional theatre method to do a projected shadow scene is to take the lens out of a large fresnel, so that there is nothing between the filament and the subject. Depending on the reflector type, it’s worth experimenting with or without reflector. Pushing the lamp tray as far forward as it will go, gives us the largest possible beam width for our shadow acting area. As a safety measure, it’s worth also deciding how you are going to protect everyone should the lamp unexpectedly explode. A bit of mesh in the colour frame or whatever. Have you hugged your shadow today? Far from being the devil in lighting, shadows can be a lighting designers friend, helping you to create great effects and “read” the interaction between your lighting and the world. Hi this is really interesting stuff. I’m not a lighting designer myself but a director and looking to find out more to help work with lighting designers in the future. I’m going to be using projections in a show on a screen behind the actors and want them both to be lit. 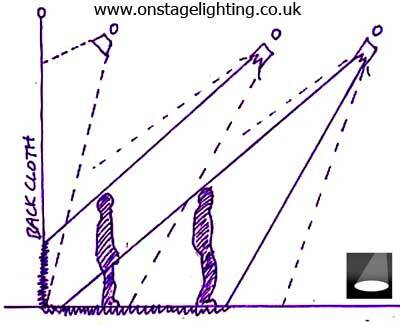 Is this easy and is it something any lighting designer will know or do I need a specialist in projection as well? I don’t know if this is an obvious question. Anyone who understands the basics of light should be able to cope with this. Many of the pioneers and high level performance projection experts are former/current lighting designers.